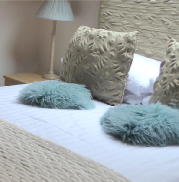 We have 6 rooms in total with a choice of tastefully finished twin, doubles and king size. 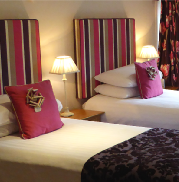 The rooms have modern amenities which the discerning guest will have come to expect. All our beds have high quality mattresses with hypo-allergenic protection. Hot water is plentiful, powerful, and regulated by thermostat. We invite our guests to check in between 4 and 6pm. or by arrangement, should you require further assistance please send me an email or telephone. Cancellation Policy - Deposits are refundable up to 48 hours prior to the booking date, If cancelled within the 48 hour period, we will still refund the deposit if the room is resold. If the room is unsold we reserve the right to take full payment for the first night of your stay. Why not enjoy a delicious full Scottish breakfast or perhaps a lighter option all served with tea or coffee. For those who would prefer not to have something cooked you could just try our selection of cereals and fruit juices all in the setting of our loch side dining room. Everything is home cooked and we only use the highest quality produce available locally. Breakfast is served between 8.30 and 9.30 unless requested otherwise. To check availability or to book your chosen room, please follow the simple instructions below. Just click on any of the names in the navigation bar to your right and this will take you into the selected room (info will include a short description, photos, tariff). After you have chosen your room, click on the green button and that will take you to our online booking facility where you can check availability and reserve your room. Large Twin Bedroom with en-suite and walk-in shower. Beautiful twin room with window seats built into the three gothic church windows on the upper floor of the house. Double Bedroom with en-suite and walk-in shower. Delightful, contemporary room with partial view of the loch and full view of the stars in bed at night! 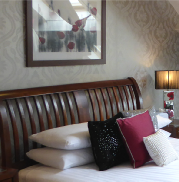 Deluxe Double Bedroom with luxury en-suite and large walk-in shower. 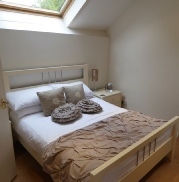 Spacious and tranquil ground floor bedroom with king-size bed, overlooking the courtyard. Deluxe Master Bedroom with luxury en-suite, whirpool bath and large walk-in shower. 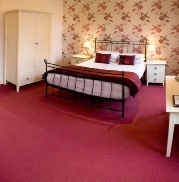 Spacious, contemporary room on the upper floor with kingsize bed. Both bedroom and en-suite overlook the loch. Deluxe Master Bedroom with luxury ensuite, roll-top bath and large walk-in shower. 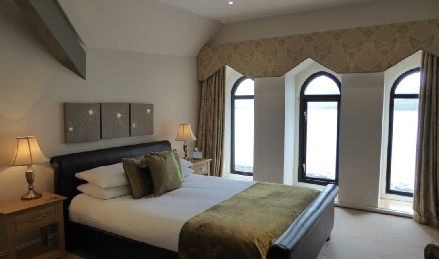 Stunning room with kingsize bed on the upper floor, overlooking Loch Fyne from three floor- level gothic windows.